Let’s be real here, I would love to know if this pregnancy glow really does exist…haha! just kidding! I know it does because I witnessed it with Niza, my sister! Her hair was so thick and voluminous, her skin was dewy and golden ahhh! But on this end, I am still waiting on all those things–because it is definitely not happening to me. But it’s ok because there are so many products out there that can help us achieve that natural glow! Growing up I always had extremely oily skin, ahh I hated it, I always felt like a grease pan! I remember one of my college roomates telling me how thankful I will be one day..well that day came 5 years later when I moved to Virginia. I’m not sure if it was my age or just the change in climate but my face wasn’t as oily any more especially during the winter months. 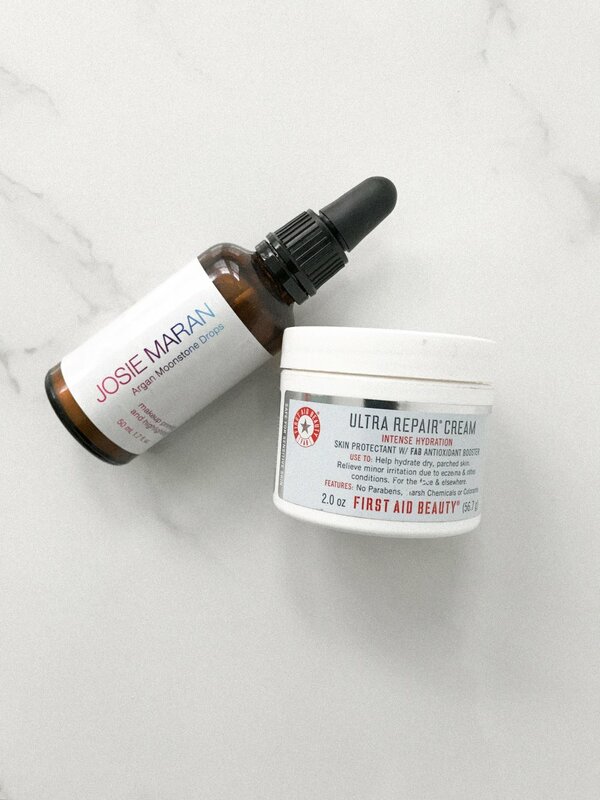 FACE - Since then I have been on the hunt for an extremely hydrating moisturizer, I absolutely love First Aid Beauty Intense Repair, it’s affordable and it really does the trick. I love pairing it with an oil on days that I’ll be wearing makeup to get a dewy look, my current favorite is Josie Maran’s Argan Drops that also serves as a primer. MAKEUP - For years I have been a faithful user of Estee Lauder’s All Day Wear Foundation, but because it was mattifying it was really starting to dry my skin out. About a year ago, my sister started using Clinique’s Beyond Perfecting Foundation and her skin literally looks flawless every time! So I decided to switch and let’s just say I am in love! It’s lightweight, full coverage, and worth every penny! I also love how great it pairs up with my favorite Contour Palette from Tarte. I am a lover of Bronze and will wear it all year but this palette as it all in the perfect shade with a hint of blush on days I want to add color. For my brows, I think everyone’s favorite by Anastasia really works well. Lastly, I stopped wearing mascara about 1.5 years ago and switched over to Lash Extensions and I can’t see myself ever going back to mascara. I love when make up looks natural and mascara on me was always so extra. It would always be underneath my eyes, it looked so caked on, and I hated taking it off. Lash Extensions have been such a blessing, I love that it is one less thing I have to do in my getting ready routine. For all my local girls I go to Lashes by Madison…she’s amazing and will help you get the look you want. HAIR - So far so good, I was really nervous about my hair falling out during pregnancy but so far all is good haha but I love volume and on some days I just want an extra boost and that is where BareFootBlonde comes in. For years, I have been looking for hair extensions that would just add volume not length and she did it! I ordered these over the summer and have been in love with them, they are lightweight and seamless! Shop Here Whether I am wearing these fills in or not I stopped using hair spray and started using texturizing spray instead..it is for sure a splurge but I love them so much Oribe Finishing Spray and Ouai Wave Spray. As I get older, spending an hour getting ready is just not ideal, let’s be real…”ain’t no body got time for that” haha and with a baby coming into the picture soon I know my time will keep getting cut shorter and shorter so I am always on the hunt for products that will speed up this process. My favorite blow dryer of all time is this Jinri Hair Dryer for under $50! It dries my hair super fast with the perfect heat setting. I have always used a curling wand to curl my hair but because you have to use smaller strands I have gone back to a curling iron so that I can speed up the process and multitask with my other hand. haha About a year ago I gave the t3 curling iron a try and was sadly disappointed, I really wanted it to workout, but within the hour my curls would just go flat. Well, just recently they had a 20% off sale and I decided to give them another try this time using the 1.25 inch barrel instead of the 1.5 inch and it did the trick! I love it! 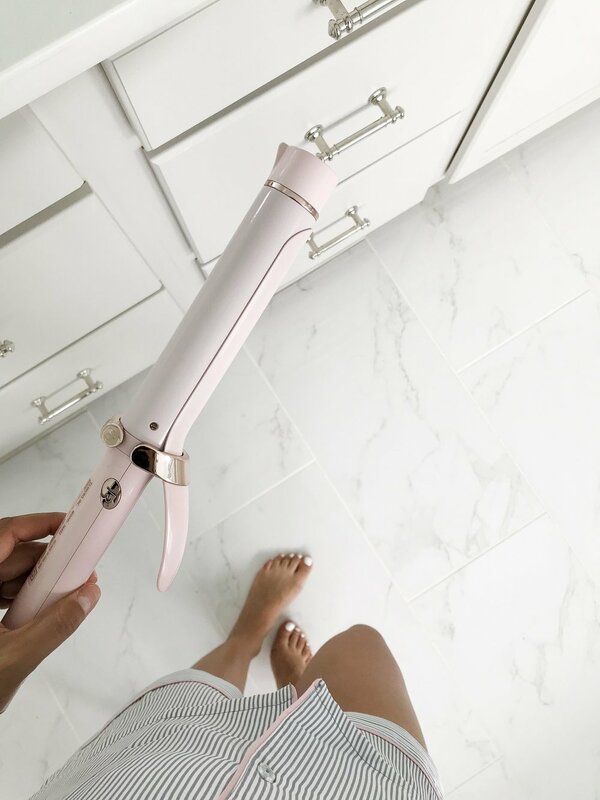 Things I love about this curling iron : the look, how quickly it heats up, how hot it gets, and that you can get it in pink or white! ;) Shop Here Still on Sale! What are some of your secrets and favorite products? Please please share!